Other than the flu and shingles shots, most adult vaccines don't get a lot of attention these days. I've shared my opinion on such vaccines pretty extensively before, so you can check the archives on my website if you want more information. I typically don't recommend them, as I think the minimal benefits do not outweigh the substantial risks. But the science behind vaccines can teach us a lot about what it takes to activate our own immune systems even better than what the vaccine is supposed to do. One immune activator has to do with inflammation. Researchers at University College London have found that excess inflammation in older folks not only decreases immunity, it can often diminish vaccines' efficacy. So they've been trying to determine whether reducing inflammation could make vaccines more effective. The researchers were particularly interested in skin cells that produced inflammation in response to a virus. They investigated this response using the varicella zoster virus (VZV), which can cause chicken pox and shingles, for a study published in The Journal of Allergy and Clinical Immunology. While the commercials on TV tell everyone that has had chicken pox is at risk of getting shingles, this isn't necessarily true. In fact, it's just the opposite. If you've had chicken pox, you should be immune to shingles, which is caused by a reactivation of VZV. The trouble comes when your immune system isn't strong enough. That's when you can end up with shingles. To do the study, the researchers recruited 78 participants over the age of 65, and 97 participants under the age of 40. All of whom had previously suffered through chicken pox. The researchers gave all of the participants one of two injections - one of the VZV antigen and one containing a benign saline solution. The researchers found that in the older participants with weakened immune systems, even the saline produced an inflammatory response. Those with the highest levels of inflammation had the weakest immune responses to the VZV, indicating that the body was not developing immunity properly. The researchers repeated the test with 18 of the older participants, this time giving them the drug Losmapimod, which inhibits an enzyme that's part of the inflammation pathway, for four days before the injection. Sure enough, the immune system responded a lot better to the VZV and developed more effective immunity. 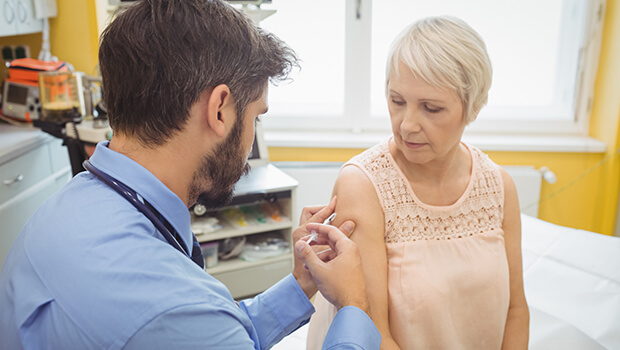 The researchers concluded that anti-inflammatory treatments prior to receiving vaccines could be greatly beneficial to older adults because by decreasing inflammation, the treatments activate the immune system, thereby making the vaccines more effective. But, why take an anti-inflammatory drug and a potentially harmful vaccine? Why not just activate your immune system without the vaccine by lowering your levels of inflammation? This makes particularly good sense in older men and women and in people who are already battling inflammatory conditions. But I don't think you need to take a drug. You can reduce inflammation and promote a healthier immune response by taking a combination of the oils in Complete Daily Oils along with Reduloxin. Reduloxin is a blend of nine herbs and nutrients that act to quell inflammation, and thus help your immune system work better to fight off all of the infections that the vaccines are supposed to prevent.